It’s no secret children now spend too much time in front of the screen. This doesn’t only hurt their eyesight and posture but it also makes them less social. So, if you’ve been looking for a way to get your little ones outside, you might want to think about turning your backyard into a place they’ll love. And to help you, we came up with five awesome backyard ideas that could be exactly what you need. According to research, only one-third of children in Australia undertook the recommended one hour of physical activity on a daily basis. If you think your children should get more physical activity, installing a basketball hoop in your backyard is something you can’t go wrong with. Just buy a hoop in your local sports shop and make sure your little ones have the necessary gear like basketball shoes. Installing your new basketball hoop should be easy as long as you know your way around tools. Children love to draw, especially when there’s a big chalkboard they can use to draw anything they want. And since a chalkboard takes up so much space, placing it in your backyard is a great idea. What’s so great about this is that they’ll have plenty of things outside to inspire them to draw even more. Not to mention that you can make a chalkboard for your children yourself. Just take a piece of plywood and paint it with chalkboard paint. Usually, you’ll go outside with your children and instead of having to just stand there, you should create separate zones for adults and children. One way to do this is to create concentric rings radiating your house. That way, you’ll be able to relax out in the fresh air while your children are playing. If you want to make sure you get the design right, having pros help you is a good idea. Finding experts in landscape architecture in Sydney you can turn to should be a real piece of cake. 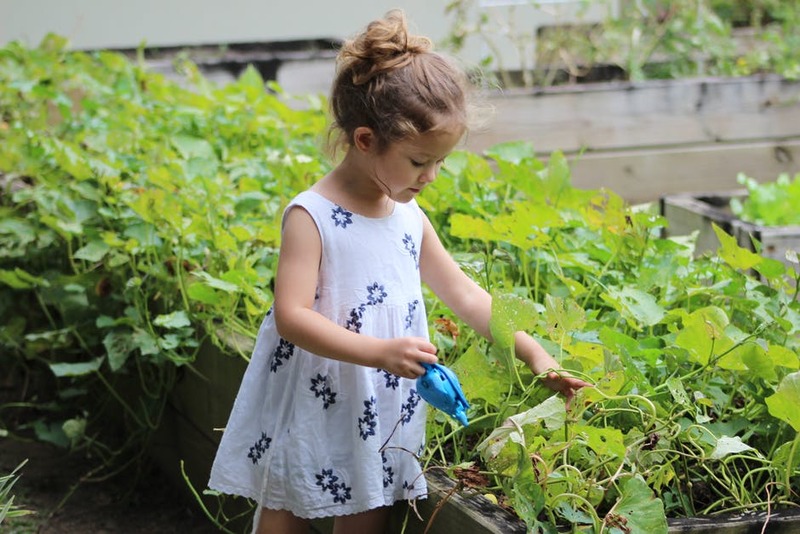 You’d be surprised to hear how many children enjoy helping their parents in the garden. That being said, starting a garden in your backyard is a great idea. Of course, if you want the whole family to get involved, making your garden children-friendly is a must. This means keeping your gardening tools safely stored inside and avoiding planting plants with thorns. We recommend choosing a couple of fruits or vegetables and having your children be in charge of planting them. With summers in Australia getting hotter and hotter, your children can spend warm days on a splash pad. What’s so great about this idea is that you don’t have to spend megabucks on a splash pad when you can simply lay out a tarp and get it wet with a hose. Add a couple of beach toys to the mix and your children will be guaranteed to have an amazing time outside. Just make sure you keep an eye on your children when they’re playing on their splash pad as falling may hurt. All of these backyard ideas are extremely easy to execute and are going to help you get your children outside. And nothing nourishes your children’s mind, body and spirit like quality time spent out in the fresh air.